1) Increased drinking: (also known as PD, or polydipsia) the kidneys are working, trying to filter out the excess glucose from the bloodstream. This creates terrible thirst. This was the first symptom of feline diabetes that I noticed with Kitty. 2) Increased urination: (also known as PU, or polyuria-note that increased drinking/urination is often abbreviated as PU/PD) as a result of the increased water intake. 3) Ravenous hunger: the body cannot use the nutrition it is getting, therefore, the cat feels hungry all the time. 4) Weight loss despite ravenous hunger: Again, the body cannot use the calories it is getting. These are all Feline Diabetes Symptoms. If your cat is experiencing one or more of these symptoms, please schedule an appointment with your veterinarian. There are other diseases that have similar symptoms, so a medical assessment is absolutely necessary before beginning any treatment. The veterinarion will usually do a full blood workup and urinalysis. The bloodwork in an unregulated diabetic cat will show elevated glucose levels. The urine will have glucose in it as well, as the extra glucose from the blood stream will "spill over" into the urine. Your vet will check for urinary tract infections, because bacteria can thrive in the sugary environment of a diabetic cats urine. Note that the bloodwork may show compromised kidneys, which may or may not be real. Many cats, once regulated, have their kidney values return to normal. The indicators od renal disease are increased creatinine and blood urea nitrigen (BUN). However, these numbers MAY be elevated due to the overwork on the kidneys because of the PU/PD. Finally, the vet may do a test called a fructosamine. In layperson's terms, this gives a longer term average of what the blood sugar values are. 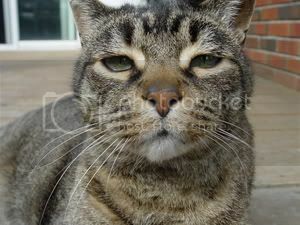 It can give an indication of how long the cat has been diabetic, or in a diagnosed cat, how well controlled they are. If you find out that your cat has feline diabetes, do not despair. In subsequent days, we will delve more into the treatment, costs associated with and current research on feline diabetes.